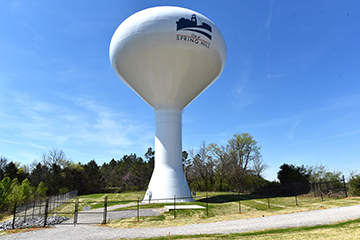 The City of Spring Hill’s new Hardin’s Landing water storage tank will be officially complete on Saturday, April 9. It’s already improving water pressure throughout the city as the tank went online in late January. The contract completion date for the $2.6 million project is April 9, which includes building a security fence around the tank, installing sod, telemetry monitoring, and paving of the entryway and parking area around the tank. The Hardin’s Landing tank is the result of more than a decade of planning, and a year and a half of construction, to meet our growing city’s demands for water capacity and pressure.